Here are two shots of the Relay valves and the horns. 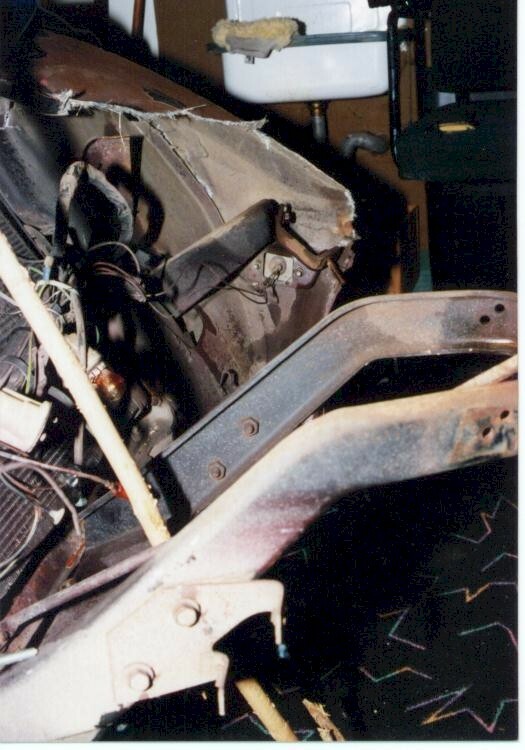 Also visible is the headlight door supports. 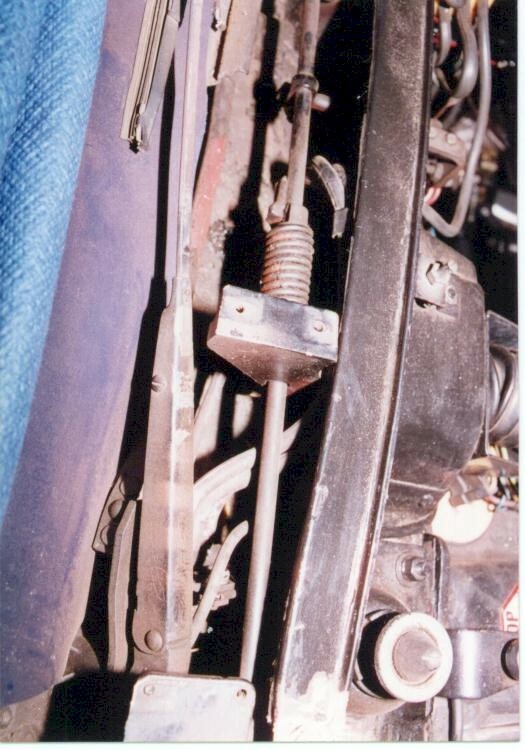 On the left picture in the upper left corner, you'll see two bolt heads sitting near the horn on the left. These hold the pivot bearings for the headlight doors. By loosening them on each side of the lights, you can make adjustments to center the headlight assembly in the opening. 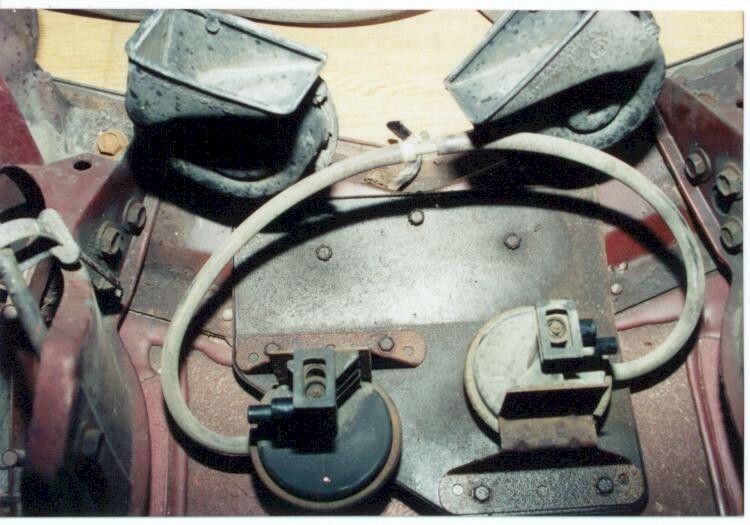 The relay valves shown above are talked about in the "Vacuum" section on the "Motor - Tech" page. This is what they look like. They control the direction of vacuum for each headlight. 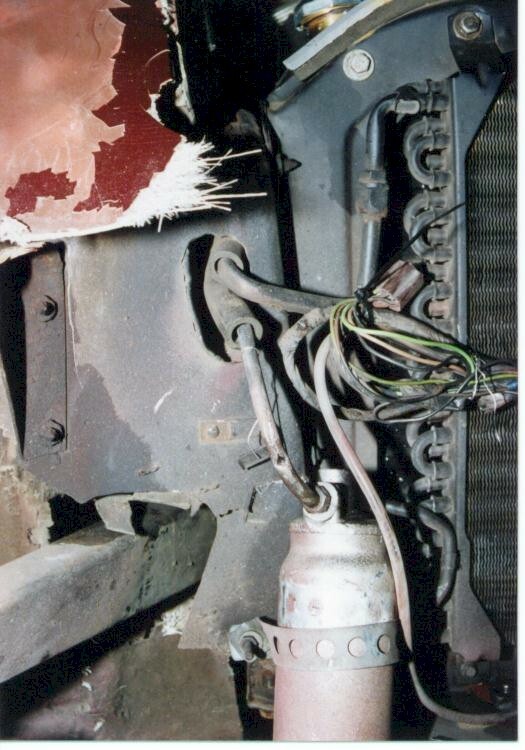 Whatever the year..make sure you put in the hardware for the side vents. Also, make sure they fit before you bond the front on. 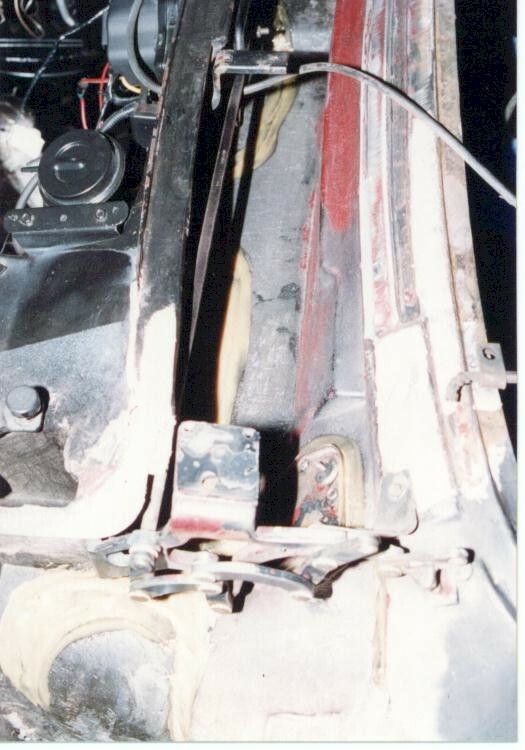 There may be some work left which could prove to be difficult after the front clip is in place. 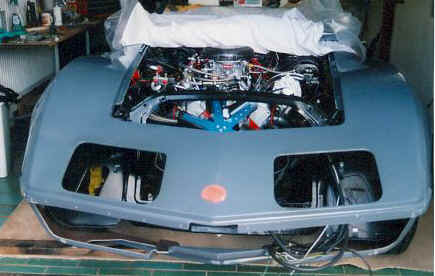 These are the 1970-72 louvers being fitted. 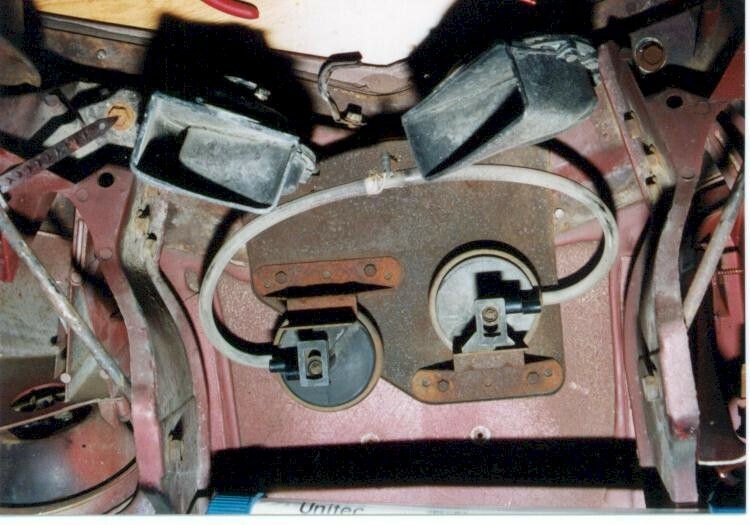 In order to assure proper placement, the fiberglass reinforcement, holding the nutplates for the upper screws in the vent, had to be attached to the vent first. 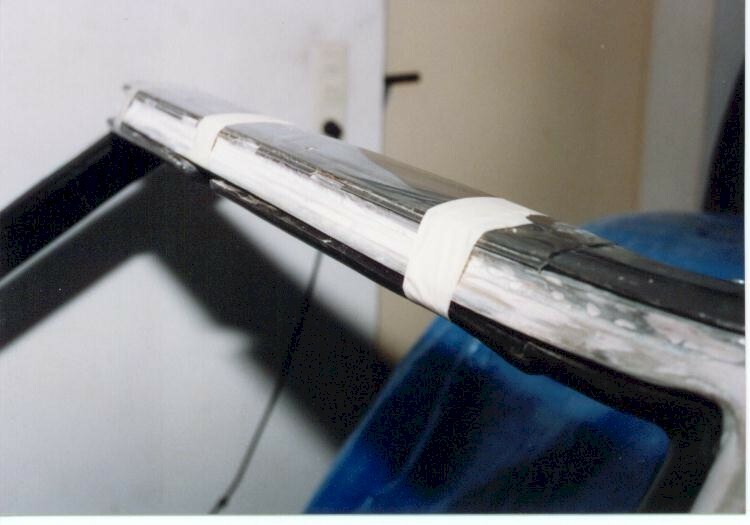 (This is the fiberglass "L" bonded to the inside of the clip above the louver) After the surfaces were prepaired, adhesive was applied to the bonding points before the vent was finally set in place. After the adhesive cured the screws and louvers were removed. The "L" remains in its permanent position. 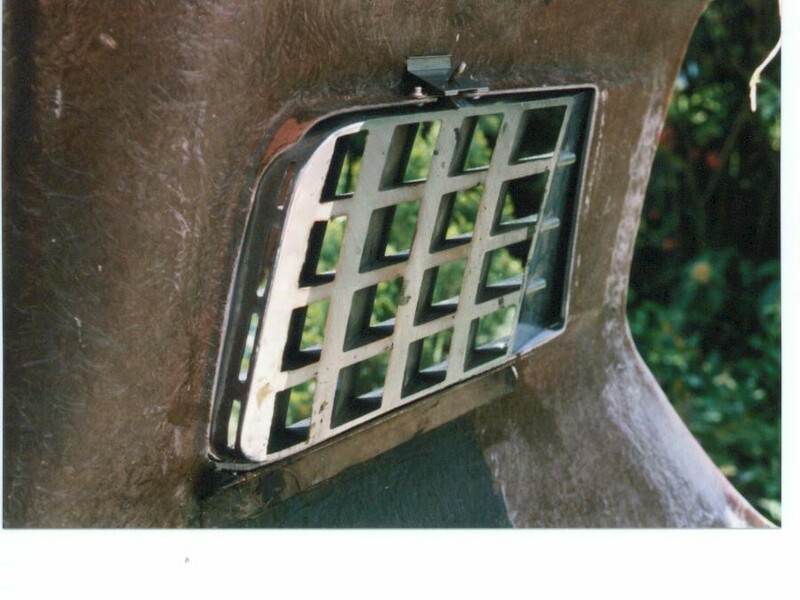 The little metal plate which engauges the stud on the vent is also installed. Some people like to paint their side louvers on the 70-72 Vettes. I had them re-chromed and then decided to mask them off as shown. Whatever you decide is up to you. 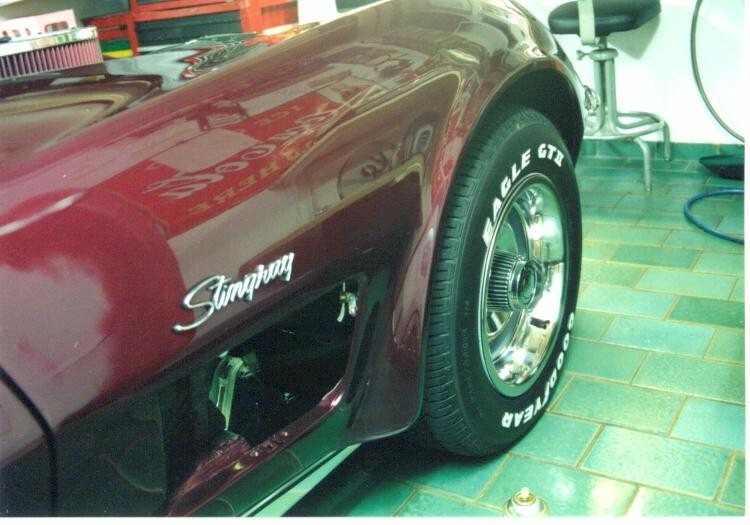 If you do decide to paint them you can use pin striping to mask off the highlighted chrome sections. (Blue). Do not attempt to use masking tape by cutting it along the highlighted areas. Remnants of glue will remain making a rough edge which will be noticeable later. The large areas can be done with masking tape but the fine lines can be done with the pin striping tape. The surface getting the paint will have to be prepaired by roughing it up a bit with 400 grit sand paper. 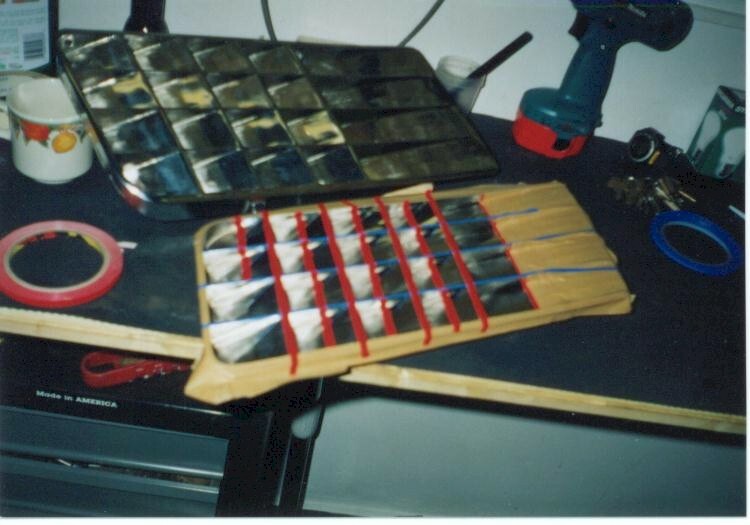 This is very tedious and has to be done carefully to avoid scratching the adjacent chromed surface. Cover the areas with masking tape to help avoid the scratches. 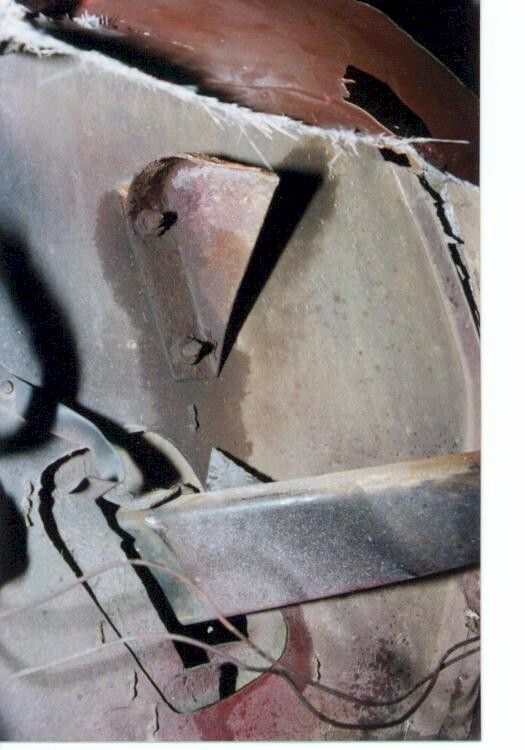 Water which seeps through and underneath the chrome and stainless windshield molding can really become a problem. 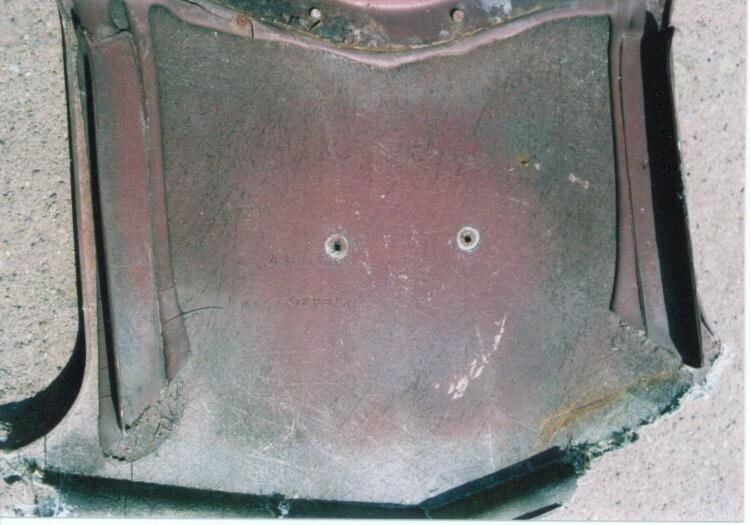 If you are planning on buying a Corvette, try to make an effort at checking this area. None of the damage you see here could be seen from the outside. Dissassembling the molding is not a big deal but does require a little time. Access for inspection shouldn't take more than 15 minutes or so. Beginning at the upper corner, remove the pressed in molding strip running from left to right across the top of the windshield. Rusted molding clips etc. are signs that further inspection needs to accomplished. Continue by removing the corner pieces. Whatever you do, make sure that you see enough to be satisfied. Sections of the winshield frame can be purchased from some of the major Corvette parts houses. 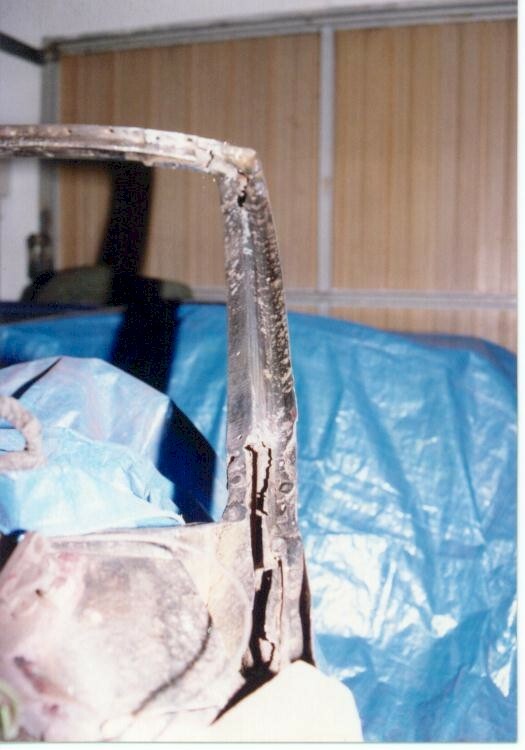 Picture one shows the windshield frame and the extent of the damage. 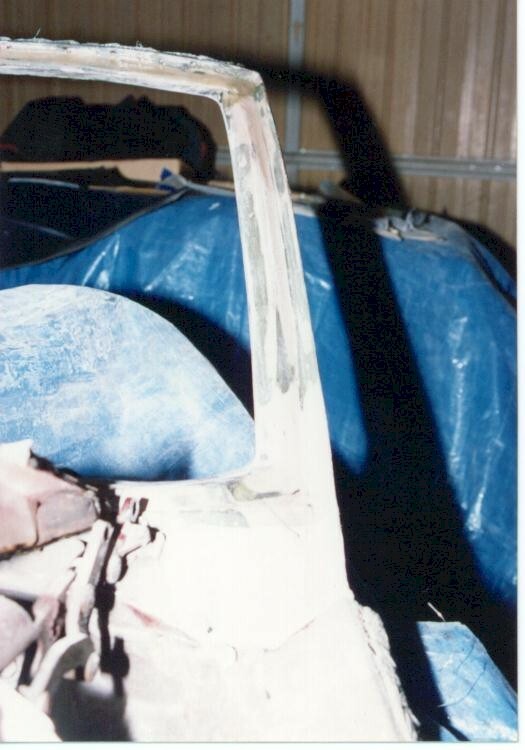 Picture 2 was taken about a month later after the welding and fiberglass/sealing work. 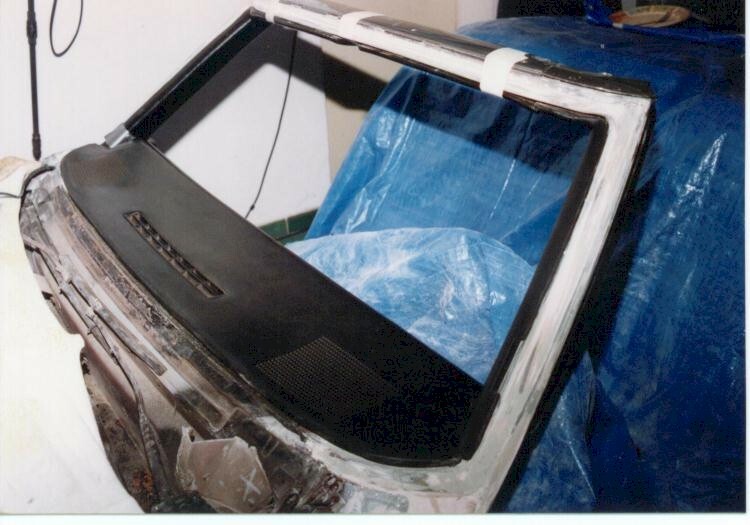 Following this, all the various contours and shapes required for the windshield and molding had to be done by hand. 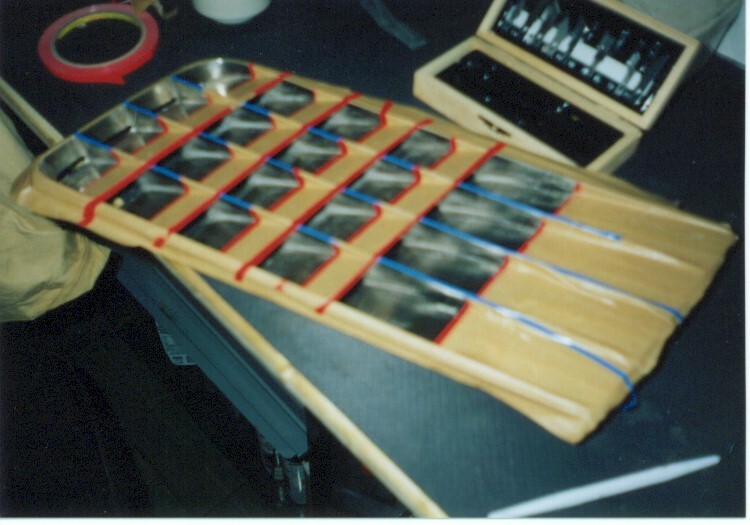 Each piece had to be re-aligned in order to find the right locations for the mounting holes. After welding in the corner pieces the entire window frame was glassed with 4 layers of heavy woven cloth and then sealed after final shaping. Following the contour work and drilling, the frame was sealed and primed. Looking at picture three you can see the piece with the "X" written in chalk. 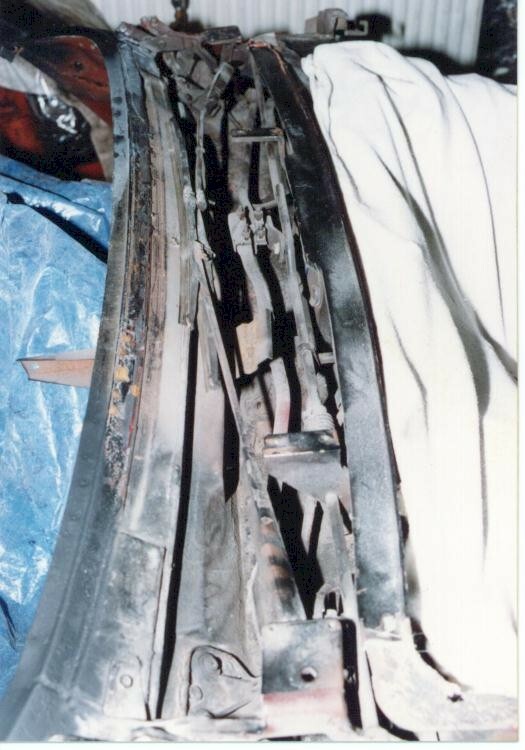 This is a portion of the bonding strip which was cut out to gain access further down the windshield post. FULL OF JUNK....Prior to actual dissassembly, it appeared that repairs would have to be made to the wiper trough. After scraping all the sealant, leaves and other debris from this area, it was actually found to be in perfect condition. Just to make sure, I decided to re-seal the seams as shown in picture three. The tan color is the sealant. I'll post the final (Finish) picture as soon as I find it.